Written by chris maroulakos on Thursday, May 13th, 2010 at 10:00am. Shout Out Louds could have been just another casualty of the sophomore slump. Their second album, 2007’s Our Ill Wills, was met with a tepid reception by fans and critics, who criticized it for being over-produced and lifting too heavily from bands like The Cure. Those complaints have been silenced with Work, the Swedish band’s triumphant return to form. 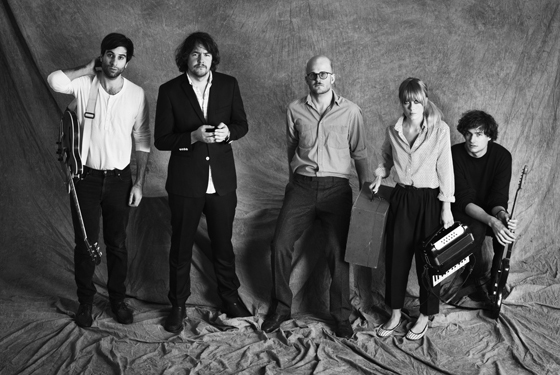 Shout Out Louds have never sounded this driven or vital, thanks to some captivating, no-nonsense arrangements, adhesive melodies, and Phil Ek’s gleaming production. San Diegans will get to experience Work standouts “Walls” (MP3), “Fall Hard,” and “Show Me Something New” on May 22nd, when the rejuvenated band joins Freelance Whales and Ok Go for an afternoon show at House of Blues. Tickets for the event can be purchased here. We sat down with multi-instrumentalist Bebban Stenborg to discuss Shout Out Louds’ revamped approach. Owl and Bear: After your second album, Our Ill Wills, Shout Out Louds’ future seemed uncertain. Did the band consider breaking up? Bebban Stenborg: We never considered breaking up and we don’t really know how that idea came into people’s heads. We had been touring non-stop for almost three straight years and we decided we needed a good rest and a few months of sleeping in real beds before we began to record another album, that’s all it was. Owl and Bear: You’ve released a short documentary, entitled At Work, about the making of the album. How much did being filmed add to the pressure you felt? Bebban Stenborg: We all know both Ted [Malmros] and Christian Haag, who did about half of the filming, so well it wasn’t much of a bother. Owl and Bear: Work is a kind of course correction for the band. What was it that made you want to change directions? Bebban Stenborg: We don’t think of it as a change of direction as much as a return back to where we came from. We are one of those bands that has never traded off any band members or done extracurricular touring with other people and we wanted to make that known through our music this time. On Our Ill Wills there was a lot of cutting and pasting; that’s how [that album’s producer] Björn Yttling works and we were intrigued by that type of creative process. It was all good at the time, but it did take away from the unified experience we were used to and that’s why we turned to Phil on this one. Owl and Bear: Phil Ek has produced some of rock’s best bands in recent years: The Shins, Band of Horses, Fleet Foxes, The Dodos, and Pretty Girls Make Graves. What was it about his production style that made you want to work with him? Bebban Stenborg: We are all great fans mainly of his older recordings with Built to Spill and The Shins, but more than anything we knew that one of his strongest points is working with actual bands, the way it used to be done. Looking for the perfect live take and rigging drums for days — that sort of thing. Owl and Bear: When the band got together to rehearse for the new album, there was a lot of discussion as to what the album should not sound like. What were some of the things you were trying to avoid? Bebban Stenborg: Boogie-woogie and anything with vampires. We were about 97% successful. Owl and Bear: Shout Out Louds have been together for almost a decade. How are the interactions between band members different now than they were at the beginning? Bebban Stenborg: Not much different at all, for good and bad. Owl and Bear: What’s your favorite city to play in the United States? Bebban Stenborg: New York and L.A. — that’s where we have the most friends. But we’re working on that in other cities too. It’s always heartwarming to see a familiar face on tour — doesn’t matter if it’s an old fling, an aunt, or a returning customer. Owl and Bear: What Swedish bands do you think American audiences need to start listening to? Bebban Stenborg: First Aid Kit for the old souls, Johnossi for the slightly newer. Owl and Bear: Will there be a fourth Shout Out Louds album? Bebban Stenborg: I’d be greatly surprised if there wasn’t.